Posted on Wed, Mar 28, 2012 : 10:05 a.m.
High in protein and low in fat, fava beans have been a Mediterranean dietary staple for millenia. 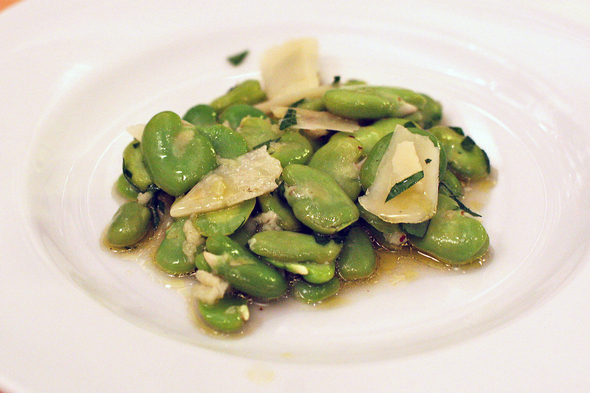 Fresh fava beans have been showing up in local grocery stores over the last couple of weeks. These broad beans are delicious, nutty and buttery and are well worth the effort it takes to prepare them. Like many Americans, my first exposure to fava beans came courtesy of Hannibal Lecter in "Silence of the Lambs." For me, fava beans, a nice Chianti, and that unfortunate census taker's liver are forever linked. But for Mediterraneans, fava beans have been a dietary staple for thousands of years. Fava beans are rich in protein, iron and fiber. They've got no cholesterol and are low in sodium and fat. Oh — and they taste really, really good. I only have one caveat when it comes to enjoying fava beans: they are a bit labor-intensive to prepare. First, you must shell the beans, removing them from their bumpy outer casing. Then drop the beans into boiling, salted water for 3-4 minutes. After the beans are nice and tender, drain them and plunge them into a bowl of ice water to shock them. After that is when the fun starts. I recommend finding a friend or two and pouring a nice glass of wine (a Chianti, perhaps?). Removing the waxy outer covering of the fava bean takes some patience and a little bit of time. But the reward of watching the bright green bean emerge (and stealing a few to eat on the fly) is well worth it. I snagged this recipe from The Produce Station's Facebook page. It originally comes from Food Network celebrity chef Bobby Flay. It's a perfect showcase for the fava bean, which stands at center stage, brightened by the tang of the lemon and garlic. It tastes like spring. Bobby Flay's recipe calls for shaved Manchego cheese, but I swapped out a Detroit-made Asiago cheese from Traffic Jam & Snug. You could also use Romano if you have trouble finding Manchego or Asiago. Fill a bowl with ice and water. Bring a large pot of salted water to a boil. Add the shucked fava beans and cook until just tender, 3 to 4 minutes. Drain and shock in ice water. Drain again and remove outer skins. Place the beans in a medium serving bowl. In a small bowl, combine the lemon juice, garlic and olive oil and whisk until blended. Season with salt and pepper to taste. Pour the mixture over the beans and mix well. Add the cheese, sprinkle with the parsley and serve. Jessica Webster leads the Food & Drink section for AnnArbor.com. You can reach her at JessicaWebster@AnnArbor.com. Thu, Mar 29, 2012 : 12:32 p.m.
Fava beans are awesome! I thought the movie reference was humorous! Keep up the good work Jess. Wed, Mar 28, 2012 : 4:26 p.m. It was also detrimental to my health to have to see a story about food feature anything about eating people...it's nauseating as well as tacky as well as cliche... I guess some folks take their taste cues from (albeit fictional) murderous cannibals, and then write about it! Thu, Mar 29, 2012 : 1:08 a.m. I laughed out loud when I read the headline. But I'm easily amused and rarely nauseated. Nice article. I'm tempted to try fava beans - if someone else does the work. Wed, Mar 28, 2012 : 7:13 p.m. So I guess I shouldn't bring up the &quot;Buffalo Bill Hot Wings&quot;? Geez! Wed, Mar 28, 2012 : 5:22 p.m.
Say it plain - sorry for the discomfort. I'm a pop culture junkie, and that Silence of the Lambs connection is forever imprinted in my brain. All that aside, the beans are delicious - especially with the Traffic Jam &amp; Snug Asiago. Wed, Mar 28, 2012 : 2:53 p.m. I love getting fava beans with my CSA share. Warm fava beans mixed with sauteed onions and carrots is one of my favorite dishes. Wed, Mar 28, 2012 : 2:45 p.m.
For those who might be uncertain about their G-6PD deficiency status, it can be deterrmined by a simple blood test ordered by your physician. The deficiency afflicts primarily (though not exclusively) those of Mediterranean origin.